Kristina thinks back to a day in 2011 when her son, Keller, woke her in the early hours of the morning. He just could not stop crying, and she knew something was wrong. She lived in The Woodlands and rushed her baby, then seven months old, to a nearby emergency room, where she promptly learned that he was critically ill and needed immediate transport to Texas Children’s Hospital’s emergency center in the Texas Medical Center. Our Kangaroo Crew was there to make that happen. Kristina rode with him, and it was the longest and scariest 40-mile trip she had ever taken. With no previous health issues, Keller was diagnosed with asthma, a collapsed lung and double pneumonia. Doctors told Kristina that he was the sickest child in the pediatric intensive care unit and that he might not make it. The next few days were touch and go, but Keller was a fighter, and he defeated all the odds against him. Today, he is on a daily regimen to manage his asthma and has never needed critical care again-but that hasn’t changed his mom’s commitment to Texas Children’s. The region’s first and only dedicated pediatric emergency center in the inpatient tower, opening in 2017, with four operating rooms, a 28-bed intensive care unit and a helipad. 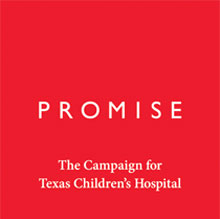 Faithful friends of Texas Children's and donors to Promise: The Campaign for Texas Children's Hospital helped us build Texas Children's Hospital The Woodlands, which opened in May 2017. Now people living in communities north of Houston have a dedicated pediatric emergency center, state-of-the-art operating rooms, critical care services and more right in their own backyard. The response from the community was more profound than we anticipated. The hospital's first-year numbers speak for themselves: they were double what our best estimates projected, confirming that extending our reach once again was the right thing to do for our patients and families. For example, Emergency Center (EC) visits during year 1 were projected to be 15,969; actual first year EC visits totaled 31,852.